Thanks to efforts by Heinrich, Albuquerque will be eligible for up to $25 million in federally backed bonds to pay for the purchase and installation of solar panels on dozens of city buildings. The solar panels are expected to be in operation within two years and will significantly reduce the city’s utility bill for electricity. The city will also train local workers to install the panels. Voters must now approve the plan to issue $25 million in renewable energy bonds. 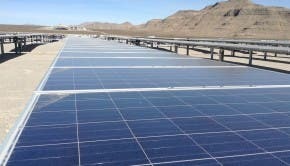 The city currently gets 3% of its energy from solar, said Sanders Moore, the director of advocacy group Environment New Mexico. City councilor Davis says the first phase of the project will take the city about halfway to its goal of being 25% solar. The legislation will outline which city buildings will be the next ones to get solar energy. “People should be proud of our city today,” Davis said. Albuquerque currently ranks ninth among US cities in total solar power generated and fourth in solar power per capita according to the Shining Cities 2017 report. Moore said the city’s high ranking is thanks to businesses and homeowners who have made the switch to solar power. The state as a whole has pushed back against those who oppose investing in clean energy, especially in areas of the state with long histories of support for the oil and gas and coal industries. She said New Mexico is the second sunniest state in the country but ranks just 13th among all states in terms of the percentage of solar power it generates. New Mexico today gets only 3% of its electricity from solar energy.